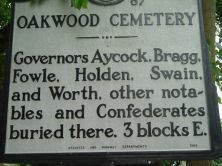 Governors Aycock, Bragg, Fowle, Holden, Swain, and Worth, other notables and Confederates buried there. 3 blocks E.
Oakwood Cemetery was founded in 1869 by the Raleigh Cemetery Association. Covering approximately 102 acres, the cemetery is located in the northeast section of the city and within walking distance of the State Capitol. Its landform is that of rolling hills and its gardens displaying an array of trees, flowers, and shrubs. 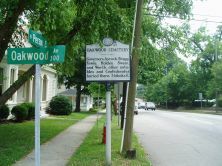 Oakwood originated as the Confederate Cemetery, founded in 1867 by the Ladies Memorial Association of Wake County. After receiving short notice that the bodies of the Confederate soldiers had to be moved from the Federal Cemetery, the Association organized the removal of 500 graves to be reinterred at the site. Land for the new cemetery was donated by Henry Mordecai, a prominent citizen of Raleigh and a state legislator. Since its founding, many notable city and state leaders have been buried at Oakwood. Among them are eight governors: David L. Swain (governor, 1833-35); Charles Manly (1849-51); Thomas Bragg (1854-58); Jonathan Worth (1865-68); William W. Holden (1865, 1868-71); Daniel G. Fowle (1889-91); Charles B. Aycock (1901-05); and Dan K. Moore (1965-69). It is estimated that about 1400 Civil War soldiers are buried there. Located next to the Confederate Cemetery is the House of Memory, built in 1935, which recognizes other North Carolina men and women who have served the nation during times of war.